Check back for weekly updates as Verdigris Ensemble creates this new work. Over nine hundred voices from diverse neighborhoods, cultural communities, and age groups chime in to finish the sentence “Dallas is…” in the latest project from Verdigris Ensemble. Ranging from tough love to unbridled infatuation, this collection of brief love letters to the city create the backdrop for Verdigris Ensemble’s 2018-2019 season finale, “Faces of Dallas.” Part of this year’s SOLUNA Festival concert lineup, the interdisciplinary concert uses the language of music to tell the stories of Dallas in a vibrant celebration of the rapidly growing city. Over the next five weeks, a team of Verdigris artists and collaborators will be opening a door for Art&Seek readers into the process of designing a fully original, Dallas-inspired choral performance. 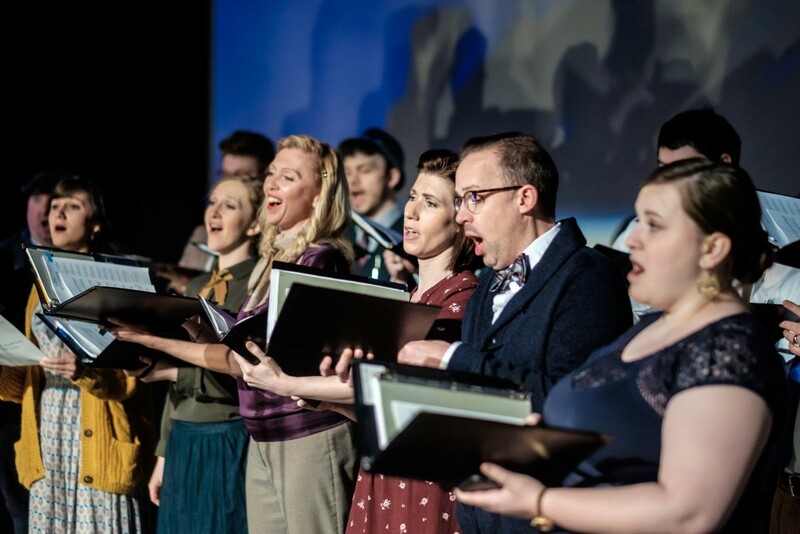 As a founding member of the ensemble, I’ve participated in the choir’s growth from our first performance – a musical narration of “The Velveteen Rabbit” – to collaborative highlights of the current season like performing David Lang’s Pulitzer Prize-winning piece “The Little Match Girl Passion” with original choreography by Avant Chamber Ballet. 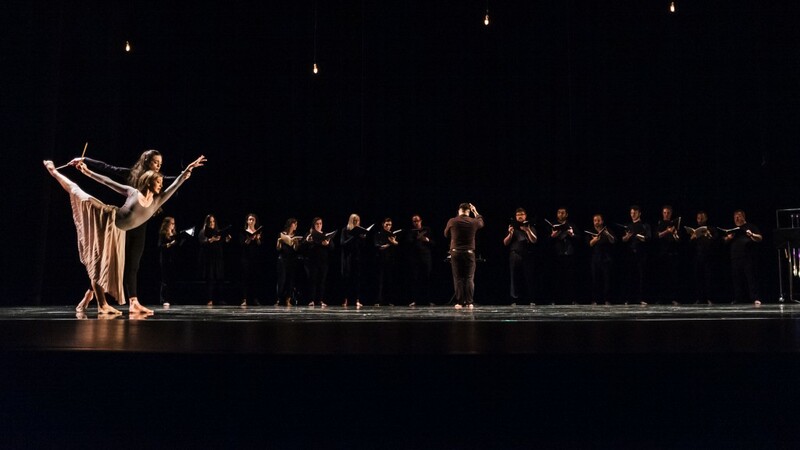 Performing David Lang’s “The Little Match Girl Passion” with Avant Chamber Ballet. Photo: Dickie Hill. Verdigris Ensemble performs Faces of Dallas, featuring David Ross Lawn at piano, April 26th and 27th at 7 p.m., and April 28th at 2 p.m. at Arts Mission Oak Cliff. Tickets here. Details here. deeply human art form of choral music can be presented with greater profundity and beauty when performed in dialogue with other artistic disciplines. With each performance, both he and his committed group of professional singers experience the power of bringing the inherent beauty of choral music to life with the added layers of narrative or other art forms. This guiding philosophy is most clearly seen in Faces of Dallas, a program built by a diverse committee of artists and organizers dedicated to setting the voices of Dallas residents to song. Throughout the 2018-2019 season, Verdigris and collaborating artists have compiled a vast collage of poetry, survey responses, and interviews. Brukhman has interviewed several community representatives, receiving stories from a refugee family, an African American genealogist, two Dallas ISD middle school students, and an LGBT activist. Their experiences of Dallas function as four narrative pillars that anchor the audience within the sea of voices represented in the concert. Additionally, Verdigris commissioned twenty local authors to each compose several lines of poetry that are woven together to create a single composite poem. David Ross Lawn, a New Jersey-based composer and artist, partnered with Verdigris Ensemble to set the collected poetry, “Dallas is…” responses, and interviews to music. Using the forms of art song, harmonic chant, and choral composition, Lawn’s ephemeral compositional style creates a kaleidoscopic musical portrait of the city. Brukhman intentionally chose a musical voice outside of the Dallas scene to provide an unbiased vantage point for the setting of the diverse collected stories. Two pieces composed by winners of the ION Young Composer competition and a commission by Meredith Tompkins performed with the middle school students of W.E. Greiner Exploratory Arts Academy add musical vantage points to the journey. Stephen Zhang, graphic designer and watercolor artist based in Plano, is currently putting the finishing touches on four large watercolor portraits of the interviewees. Far from the washed-out, placid stereotype of the medium, Stephen’s brush makes his subjects leap off the paper with vibrance and movement. These larger-than life portraits will adorn the walls of Arts Mission Oak Cliff, the beautifully renovated performance space which will host the three concerts. A first of its kind in Dallas, this program brings a unique perspective to the SOLUNA Festival, allowing audiences to experience the city’s beauty and diversity through a completely original collaboration. In a diverse city experiencing rapid growth, constant construction, and a growing cultural landscape, the survey response that “Dallas is…a middle school child” struck a particularly keen chord with organizers as they work to mold the diverse body of voices into a concert at once unflinching and celebratory. Over the next four weeks, come with me and fellow artists and contributors as we walk readers through the process of bringing life to this ambitious choral performance from its inception to its first rehearsals.